Our enrollment code is: L489B59B6146. What is SCRIP? It's fundraising while you shop! How do you buy Gift Cards (SCRIP) from Stella Niagara Education Park? Buy Online: Visit www.shopwithscrip.com or www.myscripwallet.com and send Electronic gift cards from many retailers. You can send eCards to yourself, or to friends and family as a gift! When received, you simply print the certificate and redeem it in stores, or copy and paste the code at checkout to apply to an online purchase. Reload Gift Cards: You may also reload many Gift Cards at www.shopwithscrip.com. You will see a little recycle symbol for cards that are eligible. Great for cards that you use frequently like Starbucks or Target! Order at school: Use the attached order form to order gift cards. Send in your order form each week by Thursday at 9am & receive the gift cards you order on Tuesday after 2pm! How much extra does buying gift cards from SCRIP cost? ZERO!! They cost you NOTHING EXTRA. You pay face value for any cards purchased. The retailers sell the cards to us at a discounted price. We use this profit to provide services for your children. How can families reach their $100 rebate goal? Purchase gift cards from the SCRIP program for places you shop regularly. Use these gift cards when you shop at these stores. Don’t forget to ask grandparents, aunts and uncles if they’d like gift cards too! TIP: $200 Tops gift cards a month will reach your goal by the end of the year. 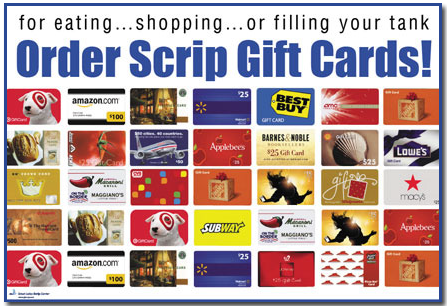 Why do we want you to buy Gift Cards from SCRIP? SCRIP is a great fundraiser for our school. Buying Gift Cards from SCRIP does not cost our families any extra money but raises THOUSANDS of dollars for our school. This money has helped to reduce the cost of tuition for our families. We need all families to participate as this is one of our school’s only fundraisers! The best way to learn about Stella Niagara is to come experience it for yourself. Call the school at 716.754.4314 to schedule a tour and see all that we have to offer. The Sisters of St. Francis have long been committed to the belief that every child is entitled to a quality education. We can only continue to offer the excellent education that Stella is renowned for with your support. Please consider making a donation to support the school.